It sounds fairly strange, no? I had heard of putting eggs in coffee before, mostly from Scandinavian countries where it was used to clarify the brew and generate an amber-coloured cup of coffee with a milder taste. 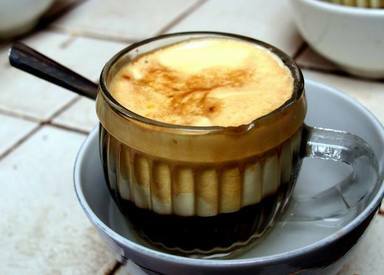 In contrast, Vietnamese egg coffee (Cà Phê Trứng) is anything but a clearer coffee with a mild taste. As it appears in the photo, it is essentially a Cadbury Creme Egg with a hint of mocha. Presto. Egg coffee for all!